California’s most northerly redwood park, Jedediah Smith Redwoods State Park, boasts some of the world’s largest trees and six miles of the pristine Smith River within its 10,000 acres. The park is named for the first non-native explorer known to have traveled overland from the Mississippi River, across the Sierra Nevada range to the Pacific Coast. It’s mostly undeveloped, hence unspoiled, but there are opportunities for camping, fishing, boating, and hiking. 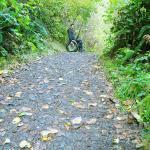 A few trails are wheelchair accessible and detailed below, see access criteria for definitions. For a scenic drive through the park that will give you a sense of isolation from the outside world, follow Howland Hill Road from Stout Grove south for five miles on a narrow dirt road to connect to Hwy. 101 just south of Crescent City. Depending on the season and when the road was last resurfaced, the ride can be very bumpy — or, as in our mid-September visit, very dusty — but will nonetheless provide an intimate encounter with an otherworldly setting. In fact, it was the extraterrestrial setting for the Ewok scene in the Star Wars movie, Return of the Jedi. Visitor Center: Staffed seasonally, the Hiouchi (a Tolowa word for clear water) visitor center is just off Hwy. 199 (access has not been verified to the small Jedediah Smith visitor center inside the campground). 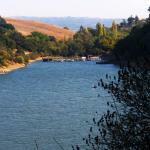 It offers a small gift shop and exhibits on coast redwoods, wildlife, and preservation history. Start your tour of the park with a 12-minute film about the redwoods, Trees of the Coast Redwood Forest, and a self-guided walk with wayside exhibits, located just outside the center. At the entrance is a contemporary example of a traditional Tolowa river craft made of redwood. Overnight Options: Jedediah Smith Redwoods State Park has a few campsite that have been modified for wheelchair access, which are #13, #17, #25, #37, #39, and #41. In 2016, four tent-cabins were established and all four are wheelchair friendly. Before you even leave the parking lot, an uprooted redwood tree seduces you to marvel at the artistry of its root structure. Start off on the Simpson-Reed loop (.6 mile), where interpretive panels invite the visitor to learn about the redwood forest. At the first junction bear right to follow the Simpson-Reed loop in a counter-clockwise direction, or left to more quickly hook up to the Peterson loop. In this ancient forest, massive, thousand-year-old redwoods tower above, while the light green shades of the mixed understory of hardwood trees, shrubs, and ferns brighten up an otherwise dark, damp atmosphere. In the fall, maple and hazelnut trees add brilliant yellow hues. What I at first thought was the sound of wind whipping through the forest turned out to be sparse traffic noise from nearby Hwy. 199; a slight distraction at first but insignificant compared to the beauty around you. Where large redwoods have fallen near the path and are in various stages of decay, it’s satisfying to see the symbiosis of life in action as new flora such as hemlock, huckleberries, and ferns sprout from the seemingly dead trees. Three-quarters of the way along the loop is the first turnoff for the Peterson Loop Trail (.5 mile). We continued a bit farther and chose the second access point. A slight downhill takes you to a 50-foot metal bridge (the first of four crossings; all are accessible) where you can see over and through the railings, although there was no water in mid-September. A few hundred yards past the bridge, you notice that you’re on a ridge with a steep drop-off, and from this vantage point you can see and hear water. There is no edge protection but the path is quite wide. This grove has a lush stream corridor where trees that have fallen in the water form staircases and pools that support fish and insects. As you travel farther inland, the car noise stops and it feels as if you’ve entered an outdoor cathedral where trees of astounding size reach for the sky, enveloping you in enchanted stillness. After the second bridge crossing the forest becomes more dense. We came upon a fallen tree that arched across the path, but it was a mystery as to which end fell, since both seemed firmly planted in the ground. Look to the tops of the trees, where debris has collected; as it decomposes, it creates a good environment for seeds to germinate and grow. These plants then provide food and homes for the animals that live high in the canopy. Toward the end of the loop is a rare opportunity to travel alongside a fallen redwood for its length –– easily 100 feet –– and feel its enormity. Each trail can be done separately, but combined they offer a 1.1-mile journey through some of the world’s biggest trees, some reaching 360 feet. Fog often lingers like a soft blanket, but in summer, when temperatures outside the forest can reach into the 80s, it’s a welcome relief. Adding to the magical experience of the Peterson Loop was that we passed only two other hikers. Typical Width: 4 ft. & above. One short section on the Simpson-Reed trail narrows to less than 30 inches where trees have fallen. Located on a small floodplain of the Smith River, this 44-acre grove was donated to the Save the Redwoods League by Clara Stout in 1921 and later became part of Redwood National and State Parks. Although the redwoods found here are not the biggest in the region, a lack of understory trees reveals their full stature. A plush layer of nine species of fern and redwood sorrel carpets the ground. From the parking lot to the trailhead, a steep (greater than 1:12) section of deteriorated asphalt descends for several hundred feet before leveling out at the start of the loop. The trail itself is compacted dirt with a thick layer of duff. We followed the loop counter-clockwise and at first passed many fire-damaged trees; although sad to see, this is a healthy part of the forest’s life cycle. Some of the only sounds you will hear in this peaceful forest, tucked away from the normal tourist route, are of the flowing Smith River — the only major undammed river system in California — yet you never see it from this loop trail. A spur trail that crosses the river via seasonal bridges is not accessible because a fallen tree at its start narrows the path to less than 2 feet in width. Fall and spring are the best months to visit; torrential rains during winter months can make Howland Hill Rd. and the trails impassable, and in summer the park can be more crowded. Typical Grade: Mostly level or gentle. The steepest section is at the beginning; otherwise the trail undulates slightly throughout. In a few places the cross-slope is greater than 2 percent and may be bothersome to manual chair users. 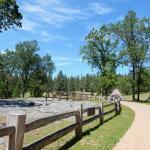 At visitor center and Stout Grove trailhead. Two accessible spaces on Walker Rd. serve the Simpson-Reed and Peterson trailhead. At Stout Grove (no sink) and Hiouchi visitor center. None at Simpson-Reed Discovery and Peterson Memorial Trails. Hours: Trails: sunrise to sunset. Hiouchi visitor center: mid-May to mid-September, daily, 9 am-5 pm; closed off-season. I has worked for more than 30 years advocating for, and educating about access to outdoor recreation and tourism for people with disabilities. I hold a degree in Recreation Therapy and was a travel agent specializing in accessible travel for many years. In this capacity, and now as Associate Director at Wheelchair Traveling, I consult with the travel industry about accessibility, conducts disability awareness trainings and writes about travel and outdoor recreation. I also authored a book titled, A Wheelchair Rider's Guide: San Francisco Bay and the Nearby Coast, about accessible trails and has produced several access guides to San Francisco. My most current project is a website of accessible trails along the entire California Coast (www.wheelingcalscoast.org). My extensive experience as a wheelchair rider combined with her professional experience has provided me with in-depth knowledge about inclusive tourism and outdoor recreation.